Middle and High School students we are going bowling. 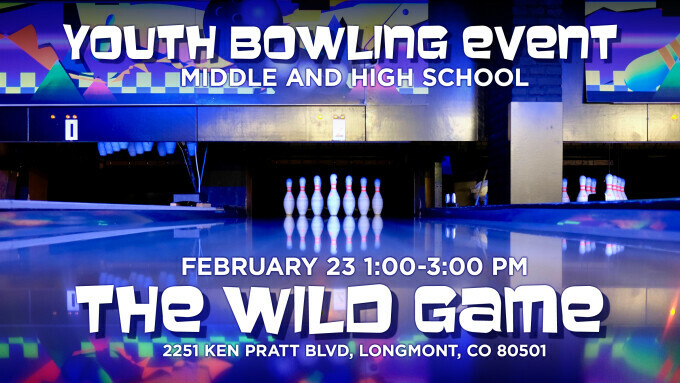 We will meet at The Wild Game in Longmont at 1:00 PM for friendship, fun, and bowling. We have many things happening at White Fields Community Church. You will often see a post about a class or a Bible study ending with "Join Us!" It might seem clichéd, but it is not at all. We at White Fields take to heart the community part of White Fields Community Church. We want to show you our community. We want to show you our Jesus. We have some ways coming up this week and in the near future. Meet & Greet is Sunday, Feb. 10, 11.30 AM after service in the St. Vrain Memorial Building.